Choose an environmentally friendly lint removal tool that actually works. This amazing little roller is super convenient, and it works remarkably well for removing lint and hair on the go. The compact size makes it perfect for traveling, so keep one in your glove box, purse or carry-on bag to eliminate unsightly dirt whenever necessary. It's totally washable and reusable, and the superior roller will remain super sticky for year of regular use. Once fully coated with dust, lint or hair, simply rinse under warm water to release the debris, and it will be good as new. There are no refills to buy ever, and it comes equipped with its own built in case. 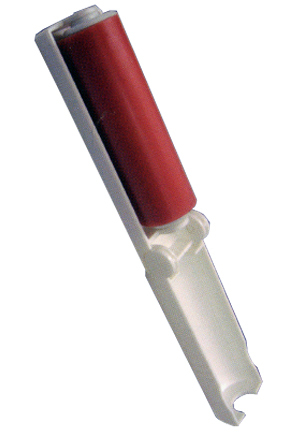 The whole unit folds in half to keep the sticky part completely contained when you're not using it, so it's always sticky, undamaged, and ready to clean when the time comes. 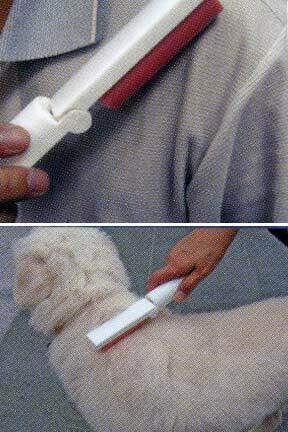 Keep this useful little tool virtually anywhere, and never worry about fuzz on your shirt, or fur on your pants. Stop wasting money on disposable lint removal products. Get this washable alternative designed for portability, and use it over and over with nothing more to buy ever. If you would prefer a slightly larger size, check out our regular size roller. It's a more standard size, but it won't be as portable. We also have large size roller with an extension pole, or a large, handheld version without a long pole, and they offer incredible surface area to quickly clean large amounts of lint and hair. Get our 2 piece set or 3 piece set to save money when purchasing multiple rollers at the same time. 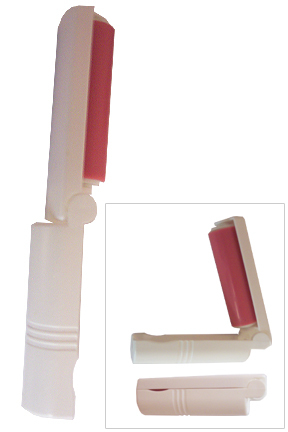 Dimensions 7.25" x 1" x 1"
Roller Size 3" x 1"
Mini Washable Lint Roller - A travel size washable lint roller. Easily remove lint and hair on the go. Great for clothing, furniture, your car and more. Just rinse with warm water and use it over and over. Stop using disposable rollers and wasting money on refills. Order Yours Today. I love it. Very handy to take on getaways or small jobs. Bought this item to give as Christmas gifts for my Patchwork Club and Sit and Sew customers. They all love the way it gets the lint, threads off of there clothes. Love that you don't have to buy refills, and the Price is wonderful. The size is perfect for your purse, sewing basket, etc. I like it! Just what I was looking for. Fits nicely in my purse. Exactly what I was looking for, I love that I can wash and keep using. Excellent service and delivery. I love how easy it is to use and clean this lint roller! Kinda small for my demands. Needs to cover more area at once. Might work to carry in purse for one or two hairs found on your black clothes. This is a fantastic little roller. I have had one for about 3 yrs now and I love it. It works like a dream, use it, wash it, let it dry, and next time it is just like new!! If you take care if it you have a priceless item. May order more because seems like when a good product comes out the next thing you know it's no where to be found. 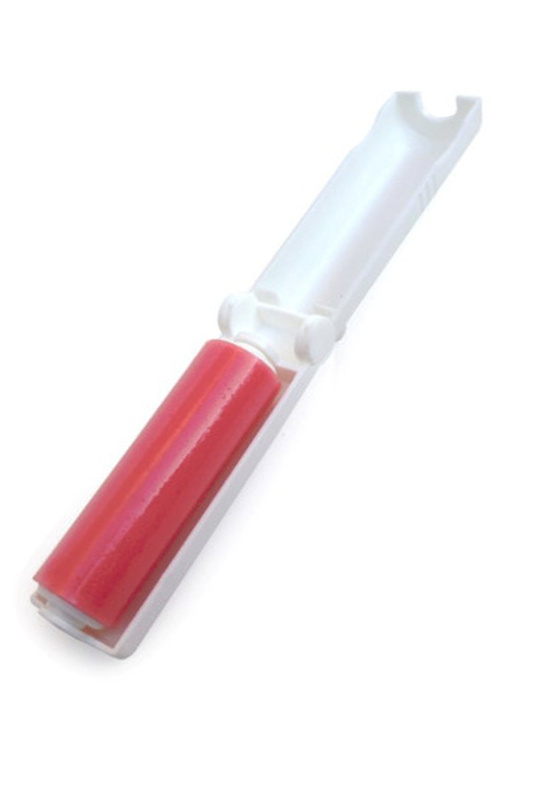 CL5103 Is the silicone roller portion pink or red? Can these be ordered in bulk of 100+? Are these available for logo imprint? We do offer bulk pricing on these, but we don't print logos on them at this time. Please call or email to discus specific quantities and pricing.